On this page we present a few photos of this interesting historical preserve. The photos were taken at different times of day and reflect the differences in appearance and color the buildings have under different lighting conditions. Kolomenskoye is located in the southern part of Moscow, across the Moskva River from downtown and considerably further south than the Donskoi and Danilov Monasteries. But it is easy to reach by subway or bus and well worth the visit. It is the former summer residence of the grand dukes of Moscow, and later of the tsars, and now houses exhibits on Russian applied art and architecture. Here is the entrance gate. The first known stone church of the Russian wooden, tent-type was the church of the Ascension, Voznesenski, in the village of Kolomenskoye, built in the Russian kokoshnik, or tent style in 1532 by Vasili III to commemorate the birth of his son, Ivan IV. Some researchers consider that foreigners participated in the construction of the Ascension church, including Petrok Malyi, who was to gain later fame for erecting the Kitaigorod wall. In affirmation of this version is that in restorations conducted in 1977, the date 1533 was found on the capital of one of the pilasters. The 16th century began with an increased impulse for splendor and the desire of the grand dukes to leave to posterity an image of their greatness. Along with this came a determination that Russian artistic aspirations be nourished to a larger extent by their own ingenuity and efforts. Russians approached this goal more successfully in architecture than in any other art. They turned their backs on Byzantine forms, which until then in various degrees and shapes had prevailed in Kiev, Novgorod, Vladimir and even Moscow (the later primarily marked by Italian architects), and returned for inspiration to their native source - the traditional wooden church construction - daringly adapting many of its forms and elements to the newly erected stone and brick churches. Stress as put on vertical lines of the structure, usually by combining a square or cross-shaped base with pointed arches and two or more tiers of recessive decorative semi-circular or ogee-shaped kokoshniki with an octagonal superstructure, and all crowned with a high tent-shaped roof ending in a small drum and cupola, or a small tower with a cross on the top of it. This type of construction required no piers inside. The entire central part of the church looked like an enormous pillar (or tower), whence came its nickname Stolpo-obraznii khram - the pillar-shaped church. Sometimes there were several smaller pillars joined together around the central one. Added porches and external galleries around the edifice further accentuated the height of the central structure, giving to it an impressive pyramidal silhouette, meant to express a heavenward impulse. Various decorative elements, borrowed from popular decorative art, add much to the beauty of these rather small but fascinating Russian churches of the 16th century. 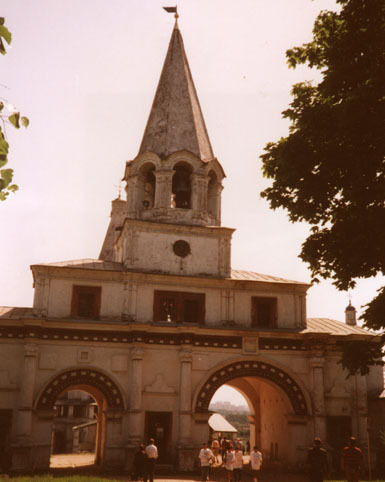 The Savior Gate with attached palaces on each side, (and view from other side,) dates from 17th century, as does the Kazan Church, the front gate and clock tower. The Bell tower was built in 16th century. The Church of Ioanna Predtechni (St John the Baptist) was built for Ivan IV in 1540's. Some items have been moved there from other locations. Among them is the in which Peter the Great lived while at Archangel. Other wooden structures are a 17th-century mead brewery from Preobrazhenskoye, a Prison Tower from Siberia (1631), and the Kazan Church and here, (1600s). Return to Moscow. Return to Russian cities. Return to Russian history. Return to Xenophon.